Ecurie Ecosse Scottish Saltire Shield Sticker. 2", 3", 4", 6" or 8". 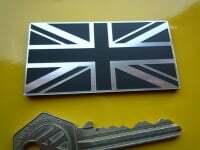 A single, full colour, machine cut to shape, Ecurie Ecosse, Scottish Saltire Shield Sticker. Sticker is available as either a 2.5" sticker for £1.99 (each sticker measures approximately 50mm by 63mm), a 3.5" sticker for £2.50 (75mm by 93mm), a 5" sticker for £2.99 (100mm by 125mm), a 6" sticker for £3.50 (125mm by 155mm), a 7" sticker for £3.99 (150mm by 185mm) or a 10" sticker for £4.50 (200mm by 250mm). Stickers are cut to shield shape, the cream square that you see is backing paper. 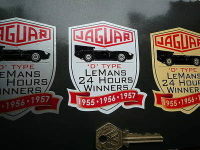 Jaguar 'D' Type Le Mans 1955, 56, 57 Sticker. 3". Jaguar Lozenge Red & White Stickers. 2", 3", 4", 6" or 10" Pair. 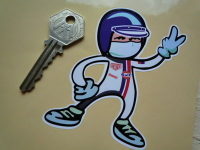 Heuer LeMans Driver 2 Fingered Salute Le Mans Sticker. 3.5". Chequered Sheet Checkered Check Flag Sticker. A4 or A6. 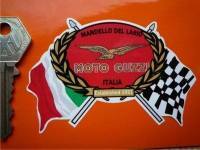 Moto Guzzi Mandello Del Lario Flag & Scroll Style Sticker. 3.75". 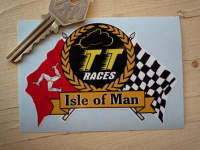 Isle Of Man TT Races Flag & Scroll Sticker. 4", 6", 7", or 10". 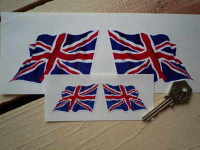 Union Jack Classic Aged Style Flag Sticker. 4", 6", or 8".